Mosaic Manufacturing’s Palette 2 is a hardware product that can be used alongside a user’s existing 3D printer or can be integrated directly into a 3D printer by the printer’s manufacturer. It enables 3D printers to combine flexible materials, soluble materials, rigid materials, and different colored materials in a single print. Photo courtesy of Mosaic Manufacturing/PR Web. TORONTO—A new multi-material 3D printing ecosystem launched by Mosaic Manufacturing includes hardware and software designed to make multi-material 3D printing more accessible to users. The ecosystem includes Palette 2, a hardware product that integrates with 3D printers to enable multi-color and multi-material 3D printing; and the CANVAS Software Platform, reported to be the industry’s first multi-material 3D printing-focused software that enables multi-material 3D printing by non-technical users. It also includes CANVAS Hub, a “bridge” that enables communication between the 3D printer and Palette 2. Although most 3D printers are capable of producing intricate pieces of work, they are limited to printing single color, single material parts. Palette 2 enables 3D printers to combine flexible materials, soluble materials, rigid materials, and different colored materials in a single print. The ability to print in multiple materials enables designers, engineers, and manufacturers to harness 3D printing in entirely new ways to directly print high-value parts, Mosaic said in a press release. Mosaic said that MakerGear, Raise3D, Dremel, Robo 3D, gCreate, and MAKEiT are Palette 2 and Palette 2 Pro integration partners and will be launching 3D printers with integrated Palette 2 experiences. As a result, users will have access to multi-material 3D printing as a native feature, the company said. Reported to be compatible with nearly all filament-based 3D printers on the market, Palette 2 can be used alongside a user’s existing 3D printer or can be integrated directly into a 3D printer by the printer’s manufacturer. By integrating into a 3D printer’s workflow to create a “one click print experience,” it is said to provide non-technical users with access to multi-material 3D printing. Mosaic said that it has placed thousands of units of its previous products, Palette and Palette+, in users’ hands in more than 40 countries around the globe. But Palette 2 is reported to provide a new level of performance, reliability, and ease of use over Mosaic’s previous products. 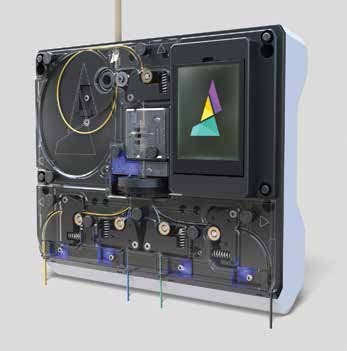 It also includes an upgraded color touch screen, auto-runout detection, and Mosaic’s next generation of solid-state filament splicing technology. Alongside Palette 2, Mosaic has developed the multi-material cloud software platform, CANVAS. Current slicing software programs on the market were designed for single material machines, and force users to go through four times the work to create a four-color multi-material print, the company said. CANVAS was designed from the start to streamline multi-material workflow, automating and simplifying the process to enable anyone using a 3D printer to access multi-material slicing.